Consider what a “connection” is: It's what you make when you connect to the server. The client sends SQL statements, such as queries, over the connection to the server. The server sends responses, such as result sets, over the connection back to the client. For this, the server uses the character_set_connection and collation_connection system variables. It converts statements sent by the client from character_set_client to character_set_connection (except for string literals that have an introducer such as _latin1 or _utf8). 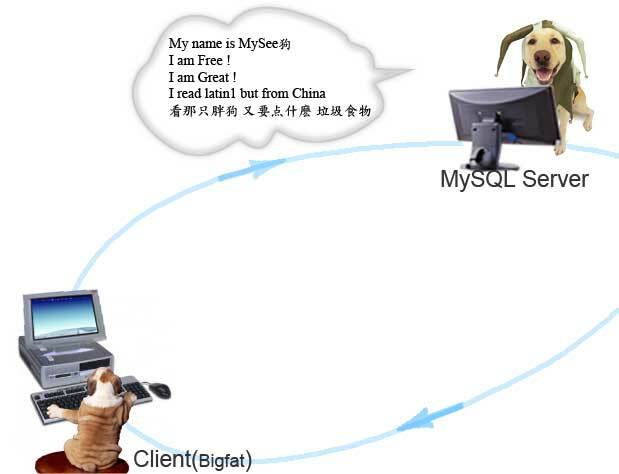 若你说：I have right to keep silence, MySQL就会把你的 "东东" ,转换为数据库默认的 "东西"
SET NAMES indicates what character set the client will use to send SQL statements to the server. SET CHARACTER SET is similar to SET NAMES but sets the connection character set and collation to be those of the default database. Setting collation_connection also sets character_set_connection to the character set associated with the collation. When a client connects, it sends to the server the name of the character set that it wants to use. The server uses the name to set the character_set_client, character_set_results, and character_set_connection system variables. In effect, the server performs a SET NAMES operation using the character set name. With the mysql client, it is not necessary to execute SET NAMES every time you start up if you want to use a character set different from the default. You can add the --default-character-set option setting to your mysql statement line, or in your option file. 问 : 为什么 不能 是中文 ? If you are wondering why -despite all UTF8 settings- you still don't get non-ASCII characters right, it might be the case that the _connection_ character set is still standard latin1. The last hint is given most of the time, but not everybody is happy to change every application (esp. when some lazy add-on and extension programmers use their own connection stuff instead of the (PHP) application. Example: Suppose that column1 is defined as CHAR(5) CHARACTER SET latin2. If you do not say SET NAMES or SET CHARACTER SET, then for SELECT column1 FROM t, the server sends back all the values for column1 using the character set that the client specified when it connected. On the other hand, if you say SET NAMES 'latin1' or SET CHARACTER SET latin1, then just before sending results back, the server converts the latin2 values to latin1. Conversion may be lossy if there are characters that are not in both character sets.